Founded in 2003, LEDART offers an increasingly broad range of light engineering solutions and is a leading Russian RGB-lighting systems developer. The OZ Mall in Krasnodar Russia is an incredible 227 000 square meter shopping mall designed by international architects Dyer and illuminated by LEDART. This modern shopping mall opened its doors in April 2012 and was awarded “Best large retail center” at the 2013 Commercial Real Estate Moscow Awards. 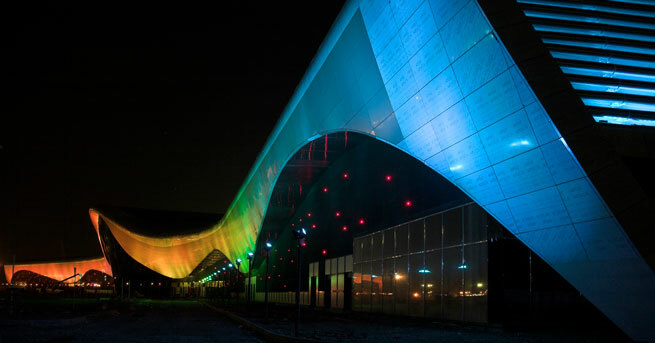 LEDART – with the help of LEDiL optics – developed more than 300 special color mixing luminaires for this huge project. The elegant aluminum body used in the design delivers excellent technical performance: it is both durable as well as providing outstanding heat transfer properties. The luminaires were installed three meters from the building and linked to a digital control unit that allows each LED to be controlled individually. One of the best lighting designers in Russia, Sergei Babalyants, then created various dynamic lighting scenes to bring this architectural masterpiece to life. Calculations showed that a similar set of metal halide (150W) white light fixtures would have consumed around 65kW. In comparison the LED floodlights consume just 17kW while providing a level of color management detail not previously possible with any other lighting solution. Special attention to the body design and cooling efficiency allowed the LEDs to be used at maximum brightness while ensuring a long lifetime. Compared to traditional metal halide luminaires that have a typical lifetime of 4 000 to 6 000 hours, these high quality LED luminaires are estimated to have an impressive lifetime of 50 000 to 80 000 hours leading to a considerable reduction in maintenance costs. These advantages together with LEDART’s patented fastening technology provide the reliability needed in a climate that can be subtropical at times. Thanks to a combination of incredibly beautiful lighting and outstanding architectural design, the OZ Mall in Krasnodar has become one the most popular landmarks in the region.